Cleavers has many different names, two that I grew up with were sticky-willy and goose grass. 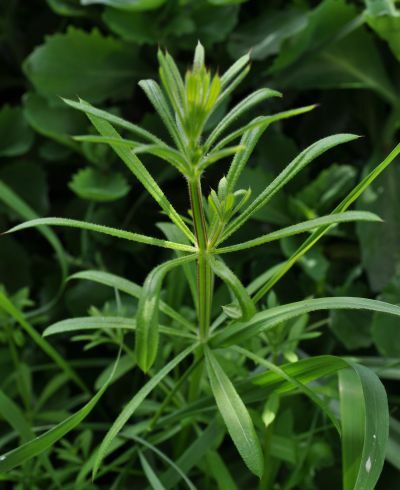 As children we had great fun with goose grass as it is very sticky and we would pick large clumps of it and stick it to the backs of our friends. Of course, the stickiness has a purpose, it is a way to disperse seeds via birds and animals. My parents always waged a war against it and it was one of those weeds that went is the bin rather than the compost bin. Apparently, cleavers is a dynamic accumulator – that is, a plant that actively concentrates certain elements or minerals. In the case of cleavers, it accumulates calcium (Ca) and sodium (Na) though it is also rich in copper (Cu), iodine (I) and silicon (Si). poultry love it! We haven’t got as far as adding chickens to the garden yet but we are planning to eventually. I guess that cleavers is particularly good for chickens because of the calcium which they need for their egg shells. compost – my parents didn’t compost it because the seeds would get all over the garden (which they do anyway!) We are going to investigate making a compost tea from it and then putting the resultant solid waste onto the compost heap once the seeds have died. coffee substitute. I read somewhere that the seeds can be dried and roasted to make a very acceptable coffee substitute. As we don’t drink coffee I don’t think we will be trying it out!